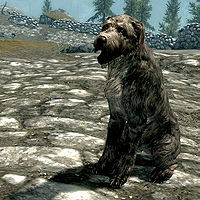 Stray Dogs can be found in random encounters in the wilderness, and will appear fighting two wolves or two skeevers. If it survives, it will approach you. If you talk to it, it can be made a follower, so long as you don't have an animal follower already. When it is told to "go home" it will return to where it was fighting the creatures and walk between two spots there. When a stray dog dies, you may be unable to recruit another dog afterwards because it will say you still have a canine follower. When changing cells, or if you tell the stray dog to go home before they have a home, the dog may vanish completely. The dog will still be alive however, and you will be unable to recruit another dog. To retrieve the dog in this situation, you will need the dog's RefID, which is different in every instance of the game. Follow the steps detailed here to resolve this issue. If you haven't yet acquired Meeko as a follower, doing so can fix this because of the automatic join option Meeko has the first time you talk to him. If your dog dies while following you, its dead corpse may drag along the ground after you wherever you go, come briefly to life to attack someone who's attacking you, then collapse and slide along after you again. It can be dismissed like any other follower. This page was last modified on 18 November 2016, at 21:47.